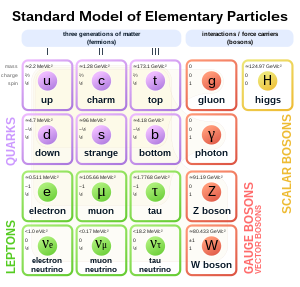 The electron is a subatomic particle with a negative elementary electric charge, indicated by the symbol e− or β−. It is classified as a fermion and as a lepton. In contemplating the papers Einstein wrote in 1905, I often find myself wondering which of them is the most beautiful. ...My favorite ...is Einstein’s paper on the blackbody radiation. ...Einstein did not try to derive the Wien law. He simply accepted it as an empirical fact and asked what it meant. By a virtuoso bit of reasoning involving statistical mechanics (of which he was a master, having independently invented the subject over a three-year period beginning in 1902), he was able to show that... the radiation in the cavity was mathematically the same as that of a dilute gas of particles. As far as Einstein was concerned, this meant that this radiation was a dilute gas of particles—light quanta. ...He realized that if the energetic light quanta were to bombard, say, a metal surface, they would give up their energies in lump sums and thereby liberate electrons from the surface in a predictable way, something that is called the photoelectric effect. ...not many physicists were even interested in the subject of blackbody radiation ...Planck, who was interested, decided that Einstein’s paper was simply wrong. Electrons and suchlike entities simply are, indeed they have always (or at least for eons) been, and they eventually made themselves known in the laboratory. It is nowadays fashionable to talk of non-human beings as though they act rather like people. The contemporary realist... might... find poetically congenial the evocative image of an electron as a tangible presence in the late nineteenth century laboratory, where, it might be said, they first learned to speak—or where, perhaps, they were no longer silenced. In physics we have outgrown archer and apple-pie definitions of the fundamental symbols. To a request to explain what an electron really is supposed to be we can only answer, "It is part of the ABC of physics". The external world of physics has thus become a world of shadows. In removing our illusions we have removed the substance, for indeed we have seen that substance is one of the greatest of our illusions. ...that physical science is concerned with a world of shadows is one of the most significant of recent advances. Several of Thomson’s colleagues thought he was joking when he argued that the electron was smaller than the atom and was a constituent of every atom; to many scientists, the idea that there could exist matter smaller than the atom was inconceivable. Yet he was proved right. And, just like it should in all stories about philosophers, it ended up in complete chaos. In all their previous discussions they hadn't even asked themselves whether such a simple object as a brick, much less an electron, is an "essential object." The role of the Higgs interaction is remarkable — if electrons could not get mass via interacting with the Higgs field then atoms would be the size of the universe and our world could not exist. Further, when electrons do get mass via the interaction with the Higgs field, quantum corrections make them so massive they turn into black holes unless some new physics yet to be discovered allows them to be stabilized at their actual mass. It must have been one evening after midnight when I suddenly remembered my conversation with Einstein and particularly his statement, "It is the theory which decides what we can observe." I was immediately convinced that the key to the gate that had been closed for so long must be sought right here. ...We had always said so glibly that the path of the electron in the cloud chamber could be observed. But perhaps what we really observed was something much less. Perhaps we merely saw a series of discrete and ill-defined spots through which the electron had passed. ...The right question should therefore be: Can quantum mechanics represent the fact that an electron finds itself approximately in a given place and that it moves approximately with a given velocity, and can we make these approximations so close that they do not cause experimental difficulties? A brief calculation after my return to the Institute showed that one could indeed represent such situations mathematically, and that the approximations are governed by what would later be called the uncertainty principle of quantum mechanics: the product of the uncertainties in the measured values of the position and momentum (i.e., the product of mass and velocity) cannot be smaller than Planck's constant. This formulation, I felt, established the much-needed bridge between the cloud chamber observations and the mathematics of quantum mechanics. True, it had still to be proved that any experiment whatsoever was bound to set up situations satisfying the uncertainty principle, but this struck me as plausible a priori, since the processes involved in the experiment or the observation had necessarily to satisfy the laws of quantum mechanics. On this presupposition, experiments are unlikely to produce situations that do not accord with quantum mechanics. "It is the theory which decides what we can observe." I resolved to prove this by calculations based on simple experiments during the next few days. If we wish to visualize... processes pictorially, no single picture is available, and the best we can do is to construct a number of imperfect pictures, each representing one, but only one, aspect of the complete set of phenomena. For instance, if a shower of electrons is shot on to a zinc sulfide screen, a number of flashes are produced—one for each electron—and we may picture the electrons as bullet-like projectiles hitting a target. But if the same shower is made to pass near a suspended magnet, this is found to be deflected as the electrons go by. The electrons may now be pictured as octopus-like structures with tentacles or 'tubes of force' sticking out from it in every direction. It would, however, be wrong to think of an electron as a bullet-like structure with tentacles sticking out from its surface. We can calculate the mass of the bullet, and also the mass of the tentacles. The two masses are found to be identical, each agreeing with the known mass of the electron. Thus we cannot take the electron to be bullet plus tentacles... we must take it to be bullet or tentacles. The two pictures do not depict two different parts of the electron, but two different aspects of the electron. They are not additive but alternative; as one comes into play, the other must disappear. Actually the situation is even more complicated, since a separate tentacle picture is needed for each speed of motion of the electron, the speed being measured relative to the suspended magnet or other object on which the moving electron is to act. ...When the electron is at rest, the tentacles stick out equally in all directions. But an electron which is at rest relative to one magnet may be in motion relative to another, and to discuss the action of the electron on this second magnet we must picture it as having a belt of tentacles round its waist. This shows that we must have a different picture for every speed of relative motion, so that the total number of pictures is infinite, and we cannot form the picture we need unless we know the speed of the electron relative to the object it is about to meet. It is clear... that the electrons—those minute particles whose size is to that of a bacillus as the size of a bacillus is to, say, the whole earth, and whose properties we may yet measure with the greatest precision— that these electrons are one of the most important foundations of our whole world structure. His discourse on 'The Recent Development of Faraday's Ideas on Electricity' ranks from its form and content among the most beautiful and profound of his Addresses. ...Commencing with an historical review of the development of Electrodynamics, which culminated in a brilliant exposition of the Faraday-Maxwell Theory, he for the first time gave a connected account of the relation between electrical and chemical forces... To arrive at an understanding of the relations between electrical forces and chemical affinity, he shows from the phenomena of electrolytic dissociation how we are to picture the ponderable atoms as bound up with electricity. He concludes from the assumption that ions are charged with electricity, that a wandering group of atoms invariably carries the same charge of electricity with it, and that electricity itself is composed of definite elementary particles which behave like the atoms of electricity. 3. The attraction of common matter for electricity cannot be the cause of gravitation, because bodies gravitate when neither electrically plus nor minus; in which neutral state, owing to the definite nature of electrical attraction, the electricity of no one body attracts the common matter of any other body. 4. On a supposition that particles, or atoms, of electricity attract one another, instead of being mutually repulsive, as is taught by preceding theories, then the quantity of electricity in each chemical atom acting on the universal electricity would confer on all chemical atoms gravitating forces represented by their respective equivalent numbers. lst. That electricity consists of parts, or particles, of a spherical form; that the whole of the terrestrial electricity is attracted at all distances by and around the particles of terrestrial common matter, they also being of a spherical form; and that the quantity of electricity attracted by each common particle is definite and unalterable. 2ndly. That each particle of common matter attracts each of the electrical particles which constitute its equivalent with a force which varies in some inverse ratio of the distances. 3rdly. That each particle of common matter attracts any portion of its electrical equivalent that may have been removed to an abnormal distance from it with a force which varies as the squares of the numbers of electrical particles contained in that portion. The facts of chemical physics point to electrification being distributed in an atomic manner, so that an atom of electricity, say an electron, has the same claims to separate and permanent existence as an atom of matter. The fundamental question then is, how far the conception of separate isolated electrons, pervading the aether of free space, can provide an explanation of electrodynamic and optical phenomena. ...Whatever view one may entertain as to the presence of qualities other than electric in the atom, all are I think now-a-days agreed that the electron is there. And whatever view one may have as to the validity and sufficiency of an æther with simple rotational elasticity, the formal equations to which that theory leads for free space are just those equations of Maxwell which Hertz's experimental work has fully verified. The problem of electrodynamics is then that of the free æther, whose properties are represented analytically by these acknowledged equations, disturbed by the action of the electrons of material atoms moving about in it. The original Amperean electrodynamics, proceeding by consideration of elements of current, has not proved valid or sufficient in matters involving electric radiation, or even ordinary electrodynamic force. A most successful modification of it was that proposed by Weber in which elements of current were replaced, as the fundamental object of consideration, by moving electric particles which acted on each other at a distance according to a law of force involving their velocities. This theory was, however, shown long ago by Lord Kelvin and Professor von Helmholtz to be untenable on account of its violating the principles of the modern theory of energy; now, of course, direct action at a distance is altogether out of court. The present question is whether a theory of electrons which act on each other, not directly according to a law of force, but mediately by propagation of the effect across the intervening æther, suffices to avoid the discrepancies of earlier theories and give a consistent account of electrical and optical phenomena; and it is maintained that the answer is altogether in the affirmative. Hendrik Lorentz, The Theory of Electrons and Its Applications to the Phenomena of Light and Radiant Heat (1916) Ch. I General principles. Theory of free electrons. H. A. Lorentz has found out the Relativity theorem and has created the Relativity postulate as a hypothesis that electrons and matter suffer contractions in consequence of their motion according to a certain law. A. Einstein has brought out the point very clearly, that this postulate is not an artificial hypothesis but is rather a new way of comprehending the time-concept, which is forced upon us by observation of natural phenomena. The rigid electron is in my view a monster in relation to Maxwell's equations, whose innermost harmony is the principle of relativity. Dianna Preston, Before the Fallout from Marie Curie to Hiroshima (2005). The theory that the atoms of matter are all built up of some simple fundamental unit or protyle has been advanced at various times by prominent chemists and physicists. One of the earliest hypotheses of this kind was that due to Prout, who supposed that all the elements were built up of hydrogen. This general point of view has received strong support from observations that the properties of elements vary in a periodic manner with their atomic weight. This is exemplified by the classification of the elements according to the well-known periodic law. In order to explain the electrical and optical properties of matter, it was generally supposed that the atom consisted of a number of positively and negatively charged particles, held in equilibrium by electrical forces. The properties of such electrical atoms were early studied by Larmor and Lorentz. [When I joined the Institute for Advanced Study in Princeton] I did this in the hope that by rubbing elbows with those great atomic physicists and mathematicians I would learn something about living matters. But as soon as I revealed that in any living system there are more than two electrons, the physicists would not speak to me. With all their computers they could not say what the third electron might do. The remarkable thing is that it knows exactly what to do. So that little electron knows something that all the wise men of Princeton don't, and this can only be something very simple. Albert Szent-Györgyi, "Teaching and the Expanding Knowledge," Science 146 (1964) pp. 1278-1279, as quoted in Ludwig von Bertalanffy General System Theory (1968) p. 5. J. J. Thomson, popular toast or slogan at his Cavendish Laboratory in the early 1900s, as quoted in Proceedings of the Royal Institution of Great Britain, Volume 35 (1951), p. 251. A new development began for relativity theory after 1925 with its absorption into quantum physics. The first great success was scored by Dirac's quantum mechanical equations of the electron, which introduced a new sort of quantities, the spinors, besides the vectors and tensors into our physical theories. ...But difficulties of the gravest kind turned up when one passed from one electron or photon to the interaction among an indeterminate number of such particles. In spite of several advances a final solution of this problem is not yet in sight and may well require a deep modification of the foundation of quantum mechanics, such as would account in the same basic manner for the elementary electric charge e as relativity theory and our present quantum mechanics account for c and h.
The reason universities have students is so they can teach the professors, and Feynman was one of the best. Through some wonderful freak of fate, I ended up with him assigned to me. He had what so many people with a purely mathematical background lack: he had a feel for the physical world. He had worked in a paint factory, I think, in the summertime before he came to Princeton. I was very enthusiastic about the idea that in the world there are nothing but particles, with Dirac thinking that the electron is the basic particle, and that if you could understand the interaction between electron and electron, then everything else will follow, everything else would be subsidiary to that simple picture. The idea of an electromagnetic field traveling through space, that's just talk. The real thing is that this electron does something, and later that electron, affected by it, does something. Action at a distance. And we found we could express that in consistent mathematical language, although we didn't get a chance to write it up until after the war. Thomson's lecture drew from Fitz Gerald the suggestion that "we are dealing with free electrons in these cathode rays"—a remark the point of which will become more evident when we come to consider the direction in which the Maxwellian theory was being developed at this time. Edmund Taylor Whittaker, A History of the Theories of Aether and Electricity from the Age of Descartes to the Close of the Nineteenth Century (1910) referring to Thomson's Royal Institution Lecture (April 30, 1897). Since it appears that all negative electricity is made up of equal particles and since it is very probable that any atom can be exactly neutral it follows that the amount of positive electricity in any atom must be an exact multiple of the charge of one negative electron. This makes it probable that positive electricity is also made up of equal parts, but so far they have not been obtained free. Maxwell's treatises, begun in 1861-62 and concluded in 1873 in his famous "Treatise on Electricity and Magnetism," as well as the brilliant experimental confirmation of Maxwell's results by H. Hertz from 1887, seemed calculated to deprive Weber's views of the last vestige of vitality. ...Maxwell's formulæ, wholly void as they were of atomistic conceptions, represented the fundamental electrical phenomena just as well as the old conceptions based upon action at a distance, and the newly-discovered Hertzian waves could only be represented by Maxwell's theory. ...this brilliant success had at first blinded physicists with regard to the insufficiency of Maxwell's theory in... optical phenomena. According to Maxwell... the vibrations of light were not mechanical, but electrical vibrations of the ether, and the two constants by which Maxwell defined the electric and magnetic behaviour of every body (the dielectric constant and the magnetic permeability) had also to be the determining elements in its refractive power. Although the condition demanded by Maxwell—of the refractive power varying as the square root of the dielectric constant—was well fulfilled in a number of bodies, yet... many bodies, notably water, showed... enormous deviations... To this was added the dependence of the refractive index upon the colour [frequency], for which the original theory gave no explanation whatever. Already in 1880... H. A. Lorentz showed that the foundations of an electromagnetic theory of dispersion could be laid in a manner quite analogous to the mechanical theory, by regarding every molecule as the origin of electric vibrations of a definite period. He says:—"Let there be in every material particle several material points charged with electricity, of which, however, only one be movable, and have the charge e and the mass μ." Lorentz derives the equations of dispersion from this fundamental assumption of vibrating charged particles. The next question is: What reason have we for assuming presence of electric particles in every transparent body? The answer is furnished by a set of phenomena which hardly fitted into Maxwellian theory, and which was, therefore, almost always in accordance with the old views. I refer to the phenomena of electrolysis. When the electric current traverses an electrolyte, then, according to Faraday's law, every unit of current deposits chemically equivalent masses at the electrode. We may, therefore, assume that every chemical equivalent of an ion wandering in electrolyte is attached to definite and unchangeable positive or negative quantity of electricity. In his Faraday Memorial Address of 1881 Helmholtz points out that Faraday's law necessarily implies the existence of electric atoms. For since the charged chemical atoms called by ions (i.e., wanderers) are liberated at the electrodes as neutral bodies, there must be a giving up of the charges or a partial exchange with charges of opposite sign. During this process, which cannot instantaneous, the charges must, therefore, be capable of existence during a short time at least. It obviously suggests itself to regard this always uniform unit charge as an elementary quantity of electricity, as an "electric atom." And when a neutral molecule—say NaCl—splits up in +Na and -CI when dissolved in water, it is most probable that both the sodium and the chlorine atom had their charges beforehand, and that these charges were not appreciable [apparent] because they were equal and opposite. But if we consider a ray of light traversing a crystal of salt, the charges and the atoms they accompany must be thrown into vibrations, and must influence the propagation of the light. It is, therefore, the electrolytic valency charges which we have to regard as the electric particles vibrating a transparent body, and whose attractive forces, as Helmholtz showed, probably constituted the greatest part of the forces of chemical affinity. Now, although the plans of the edifice of the electromagnetic theory of light were laid in 1880 by H. A. Lorentz, and even indicated much earlier by W. Weber, a full 10 years were required before the discoveries of Heinrich Hertz gave the impetus to collect the building stones and work them into shape. In the years 1890-93 a number of works appeared by F. Richarz, H. Ebert and G. Johnstone Stoney, mostly dealing with the mechanism of the emission of luminous vapours, and in which attempts are made, on the basis of the kinetic theory of gases, to determine the magnitude of the elementary electrical quantity, called by Stoney by the now universally accepted name of electron. The result of these calculations is important, as showing that it does not clash with other experimental data. Thus, H. Ebert proved that the amplitude of an electron in luminous sodium vapour need only be a small fraction of a molecular diameter in order to excite a radiation of the absolute intensity determined by E. Wiedemann. The way of determining the amount of electricity contained in the electron is very simple. The quantity of electricity required for the electrolytic evolution of 1 cubic cm. of any monatomic gas is divided by Loschmidt's number—i.e., the number of gas molecules contained in 1 cubic cm. Considering the uncertainty of this number, it can only be said that one electron contains about 10-10 electrostatic units. The value of this number would be very questionable but for the circumstance that a whole series of other methods... tend to very similar values. While it thus became clear that the supposition of vibrating ionic charges was compatible with observed phenomena as regards the order of magnitude, two works appeared... which completed the edifice of the electromagnetic theory of light. Of these works, that of Helmholtz only deals with the special question of the dispersion of light in absorbing media, while the other, due to H. A. Lorentz, goes much further. It shows how the assumption of vibrating charged particles in transparent bodies eliminates all the difficulties in the way of an adequate explanation of the propagation of light in moving bodies, such as the aberration of stellar light. Lorentz's theory leaves Maxwell's theory untouched as regards the free ether. A material body influences the optical and electrical processes only by virtue of the electric charges contained in it, while in the interspaces filled with ether everything remains unhanged. Maxwell's "dielectric constant" therefore disappears as a fundamental conception in Lorentz's theory. It becomes a derived conception, and it is immediately seen that for rapid electric oscillations, in which the inertia of the vibrating charges enters into consideration, it has no significance. The same applies mutatis mutandis, to the magnetic permeability. In view of the facility with which Lorentz's theory explains the dispersion and observation phenomena, a direct proof of its truth was hardly required. But that was also forthcoming. In 1896 a pupil of Lorentz, P. Zeeman, discovered a phenomenon whose existence Faraday had vainly sought for in 1862. If a luminous vapour, say a sodium flame, is brought into a strong magnetic field, the spectrum lines of the vapour show peculiar changes, consisting of a doubling or trebling, according to the line of vision. These changes are predicted by Lorentz's theory. The Zeeman phenomenon further permitted a determination of the inert mass connected with the vibrating charges, and then a striking result was obtained: the vibrating electron is always negatively charged, while the positive charge is stationary. The ratio of charge to mass is that of 17 million electromagnetic units to 1 gramme, and since 1 gramme of hydrogen only contains 9,650 units, it follows that the mass attached to the vibrating electron is only about 1/2000th part of the hydrogen atom. The original and almost tacit assumption that the whole ion—i.e., the chemical atom plus its valency charge—was in oscillation must, therefore, be abandoned. We must suppose that the charge, just as is the case in electrolysis, has also an independent mobility in the light-emitting molecule, and that the mass concerned in the Zeeman phenomenon is that of the electron itself. We thus arrive at a view which nearly coincides with the old conception of Weber, but with the important difference that instead of a direct action at a distance we have an action transmitted by the ether, and further, that we have now a perfectly distinct numerical estimate of the magnitude of the electric atoms. Another difference from Weber is this: Weber assumed at haphazard that the positive particles were the more mobile. Now, in accordance with the Zeeman effect, we must give the negative particles that property. It has been found that in other electron phenomena also, it is always the negative electron which appears as the freely mobile one. Whence this curious one-sidedness comes, whether it will some day be possible to prove the existence of a free positive electron, or whether we must substitute a unitarian theory for the dualistic theory of electricity, we must leave to future developments.